MVD Visual released a DVD of The Point! on November 20, 2012. 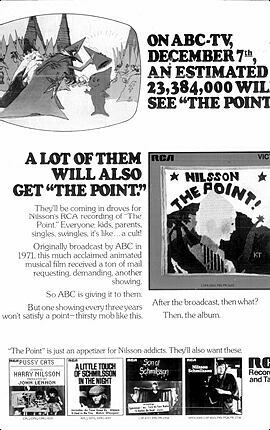 The Point: The Definitive Collector's Edition includes the animated film plus twenty-five minutes of bonus material including: Who Is Harry Nilsson?, Pitching the Point, Making the Point, and Legacy Of The Point. Click here to order the DVD release from Amazon.com. Once upon a time in the town of Point, everything - all the buildings, trees, and even the people were pointed. Except for one little round-headed kid named Oblio. The Point! is a wonderful adventure, enchanting both children and adults since 1971. Harry Nilsson's The Point! tells the story of Oblio and his dog Arrow through narration and song. The The Point! album (available on CD) is narrated by singer-songwriter Harry Nilsson. The home video release is narrated by Ringo Starr. The Point! debuted as a "movie of the week" on the ABC television network on February 2, 1971, at 7:30pm. Dustin Hoffman narrated the animated tale of Oblio and Arrow's adventures in the Pointless Forest. Apparently due to a contractual dispute, Alan Barzman narrated a later airing of the film. Alan Thicke narrated a version shown on the Disney Channel. Murakami-Wolf Productions, Fred Wolf Films, and Nilsson House Music produced The Point! Harry Nilsson wrote the original story as well as the songs. Fred Wolf directed the film. Nilsson first conceived the idea for The Point! while recording his Nilsson Sings Newman album. At the time Nilsson was working on the song "Think About Your Troubles" and described to Allen Zentz, the recording engineer, how Nilsson often visualized songs as cartoons. The Point! has also been staged as a play a number of times. The most famous version is the 1977 London version starring Micky Dolenz and Davy Jones. Fred Wolf Films has proposed an animated TV series, "The Never Ending Adventures of Oblio and Arrow", based on The Point!. Easter Eggs in The Point!